A beautiful litter born 12th November, 2008 to our lovely girl Peggy. Twelve gorgeous healthy puppies, six girls and six boys. Mother and babies all did extremely well, Peggy was a great Mum. The father, Gus was congratulated on such a handsome litter however he seemed unimpressed and refused to offer cigars. Gus has proven to be a wonderful sire with us and other breeders. 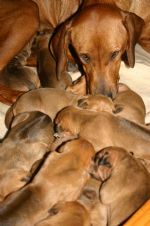 A repeat mating of our 2008 litter produced an equally lovely litter with 11 beautiful puppies being born on 6/3/2011. The safe arrival of eleven healthy Veldthund puppies! This litter was a repeat mating between our beautiful Peggy (Aust. Ch. Sanyati Persephone) and our handsome Gus (Aus Ch Marmatia Gunella Gusto). A proven combination producing sound confirmation and lovely temperments. 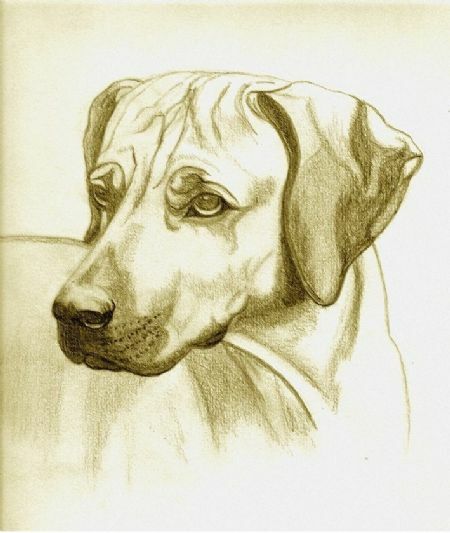 Both Peggy and Gus are not only our much loved pets but are successful show dogs. They are both available for viewing on request and pedigrees, hip and elbow scores and photo's the can be viewed on this website. 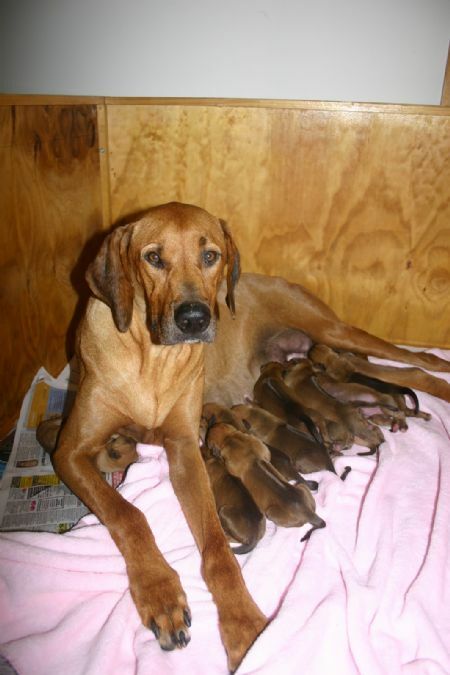 The puppies were born on 6/3/11, 6 males and five females. All puppies went to wonderful homes. They were fully vaccinated, registered, wormed, microchipped and came with a comprehensive Puppy Kit. Our puppies are always well socialised and raised in a safe and hygenic environment. 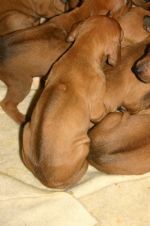 Although we do not often breed litters any puppies will be advertised on this website. One week old and thriving. Twelve healthy puppies. What a mum! Ever doting, Peggy spends almost 24 hrs a day with her babies. Now around 1.5kg each at 12 days old. Time for a snooze after lunch. Puppies at three weeks. As they grow we have to use a bigger litter box to prevent escape! 3 weeks of age. A typically beautiful ridge from this litter. At three weeks. Aren't they gorgeous? Peggy takes a break on the lounge in between feeds. She's done a great job with 12 puppies and soon they will be weaned. Two girls we ran on to 16 weeks. Both beautiful but we just couldn't keep more ridgebacks. Veldthund PG Induna, one of the pick boys showing great potential for the show ring. 6 weeks of age in this photo and below at 2 years of age. Some of the puppies playing in the clam shell. They loved the water on hot days. Meal time for about half the litter. 8 weeks of age. Veldthund PG Induna at the RR Specialty Sydney 2010. 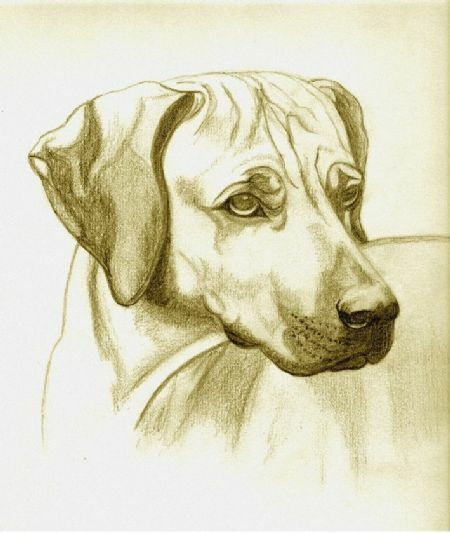 A lovely dog from a lovely litter. It was so good that we repeated the mating with puppies born in March 2011.